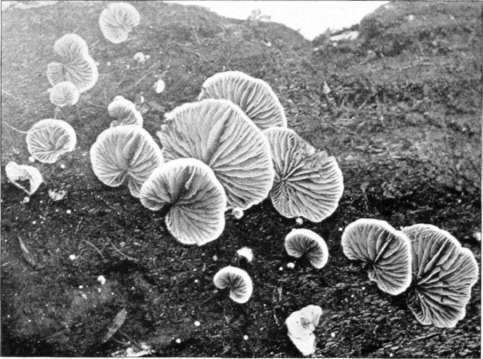 This section is from the book "Studies of American Fungi: Mushrooms, Edible, Poisonous, Etc. ", by George Francis Atkinson. Also available from Amazon: Studies of American Fungi: Mushrooms, Edible, Poisonous, Etc.. In Crepidotus the pileus is lateral, or eccentric, and thus more or less shelving, or it is resupinate, that is, lying flat or nearly so on the wood. The species are usually of small size, thin, soft and fleshy. The spores are reddish brown (ferruginous). The genus corresponds to Pleurotus among the white-spored agarics, or to Clau-dopus among the rosy-spored ones. Peck describes eleven species in the 39th Report, N. Y. State Mus., p. 69 et seq., 1886. Crepidotus versutus. Cap white, downy; gills whitish, then rusty (twice natural size). Copyright. Crepidotus herbarum Pk., is a closely related species, separated on account of the smaller spores. Both species grow either on herbs or decaying wood. As suggested by Peck they are both closely related to C. chimonophilus Berk., which has "oblong elliptical" spores. The shape of the spores does not seem to differ from the specimens which 1 have taken to be C. versutus. Crepidotus applanatus Fr., is a larger species, shelving and often imbricated. Crepidotus fulvotomentosus Pk., is a pretty species with a tomentose cap and tawny scales, usually occurring singly. It is closely related to C. calolepis Fr. Figure 154 is from plants of Crepidotus versutus Pk., (No. 2732 C. U. herbarium) collected on rotting wood at Freeville, N. Y., eight miles from Ithaca. The plants are represented twice natural size.